Balancing, relaxing and strengthening. One of the most precious oils in the world, the intoxicating fragrance of Tuberose Absolute is sweet, luscious, floral and honey-like, with spicy and narcotic undertones. This is a captivating, mesmerizing and sensuous fragrance that is considered a powerful aphrodisiac that increases libido, which explains why it is known as ‘Mistress of the Night’ in India. According to Ayurvedic medicine, inhaling tuberose opens the heart chakra. Tuberose Absolute has anti-spasmodic properties that can be used in massage to treat muscular aches, pains and cramps, and its powerfully relaxing attributes help to ease nervous tension and stress. It is valuable in skin care treatments and creams not only for its captivating and hypnotic aroma, but because it stimulates the skins micro-circulation which rejuvenates and revitalizes a tired, dull, lifeless complexion. Several studies have found that tuberose is also an effective antibacterial and antifungal agent. Tuberose Absolute brings fortitude and perseverance to those who fall victim to sudden, and sometimes rather unpleasant changes in life. It is an extremely grounding, stabilising, fortifying and empowering oil which helps keep ones feet firmly on the ground whilst adverse conditions are dealt with. It is effective also for dispelling depression, anxiety and negativity, offering support throughout a transformation of character. This makes tuberose ideal for treating obsessive behavioural problems. Please note: Tuberose Absolute has a rich waxy consistency and at cold temperatures this oil sometimes sets completely. Simply placing the bottle in warm water for 10 to 15 minutes will get the oil flowing properly. 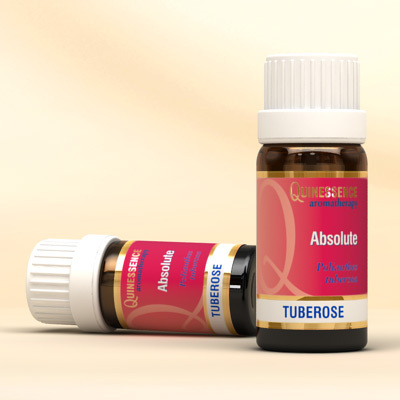 Tuberose Absolute is also available from Quinessence as a 5% Dilution. Benzyl benzoate, Methyl benzoate, Pentacosane, Benzyl alcohol, Geraniol, 7-Decen-5-olide, Methyl anthranilate, 1-Hexadecene, Methyl salicylate.